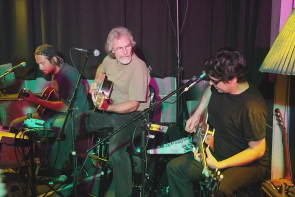 Papa King Cole has been a familiar face on Lethbridge’s music scene for many years. He rarely plays live and records even rarely so his new CD is a special treat, not only because it features music he has been working on for a long time, but also features some of Lethbridge’s hottest young talent backing him. “Gutted to the Studs” features the lead guitar of Scott Mezei sprinkled throughout. He plays with several local bands including Adequate, and is a familiar face to fans of New West Theatre. The Cd also features long time band members, guitarist Darryl Düus and Evan Uschenko , who have moved away to Lethbridge so it is nice to hear them both on a recording. Steve Keenan, who has played with Zojo Black and Paul Kype and Texas Flood lends a solo to “Beale Street Boogie,” one of my favourite Papa King Songs. But front and centre is Papa King’s big, gravelly Tom Waits/ Dr. John timbre voice and a plethora of different acoustic guitars, (which are lovingly listed on each song they are featured on) picking beautiful delta style blues music. The CD is expertly and crisply recorded. So you hear every single note as clearly as if King was playing in your own kitchen. It is tough to choose a highlight off the CD as all of the songs are so well done. “Box of Tools” also stands out with it’s smooth, slinky Pink Panther groove. The groove is strong in “Shaken” as well which will get your toes a tapping. The CD is very folksy and personal. Like a lot of modern folk and blues CD, King provides liner notes lovingly listing the performers and anecdotes about what inspired the songs and the stories behind some of them. As he doesn’t have them on sale online, you’ll have to get a copy for your very own by going to one of his shows, such as Jan. 9 at Plum.